The lock-back mechanism is a well-known type and it can be found on an incredible amount of knives in history. It is a decent mechanism and it is a full contact type and by that I mean it is a design that incorporate the spring and lock simultaneously. It is also fully tight and this is also into my full-contact mindset. 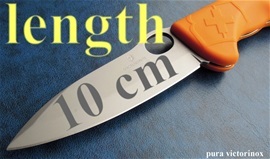 The strength of this type depends on the precision and dimensions of the materials. 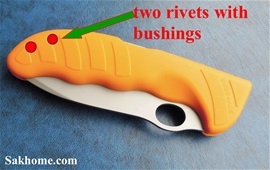 With pressure against the edge then the back of the blade and tang rest against the contact areas on the spring and can take tremendous pressure if the design and rivets are according. There are several similar designs and a huge variation of types. 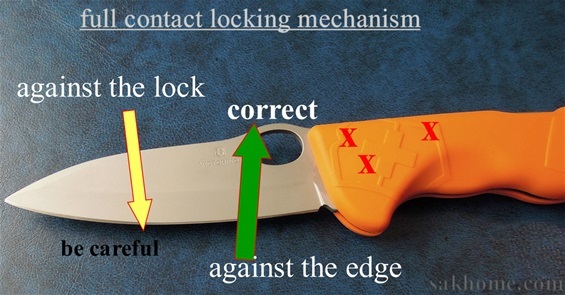 Against the lock when backing out of a cut it is a safe mechanism. I would say it is smart to avoid any pressure against the lock unnecessary and make a habit of this. When you apply extra pressure against the lock then the strength of it depends on the spring, cut section of the tang and precision of everything. 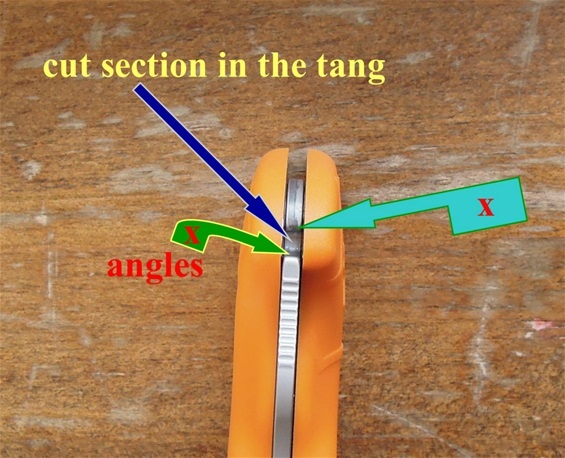 It is not only what many believe that the cut section of the tang hooks into the counter part of the spring avoiding it to fold. At one point the lock-back mechanism may collapse. In my experience it is the precision and the depth of the cut section in the tang and counter-part on the spring that are most important to avoid the collapse or folding of the blade. The precision of the design and some spring tension is important. The precision of the complete design and mechanism will distribute forces on several contact parts and make this mechanism a safe one. The durability on the lock-back mechanism depends on maintenance, use and materials. Maintenance from time to time will prevent unnecessary wear on the mechanism. In my experience some oil on the blade so it moves freely opening and closing. Some also use a very small amount of oil on the lock. The surface on the spring and tang may influence the mechanism. In the design on lock-backs there are many times taken into consideration the durability and that it will continue to be safe from wear. It is fully possible to make it able to continue to lock even with or after wear of the contact part. It is important that the mechanism is free from dirt and substances. Next is the design of the cut parts and counter-part in the spring. This is very important because the design and angle of this can very much influence the safety when engaging it. It is about distribution of forces, precision and angle that will prevent collapse. Lock-backs are many times under estimated today. If it got all the correct design features then it will be safe. Lock-backs can become a very advanched mechanism with small and extra design features and angles. It can be made to press the tang and spring together in an advanched way. Like i mentioned above the durability from wear are many times or usually taken into consideration. Precision and quality in the design avoid unnecessary wear on contact parts together with maintenance. The lock-back on the Victorinox Hunter Pro is very different from the liner lock used on the 111mm Services Range. The same is with the Michael Walker liner-lock vs the Victorinox Liner-lock to prevent accidental closing. They are not any way near in design. 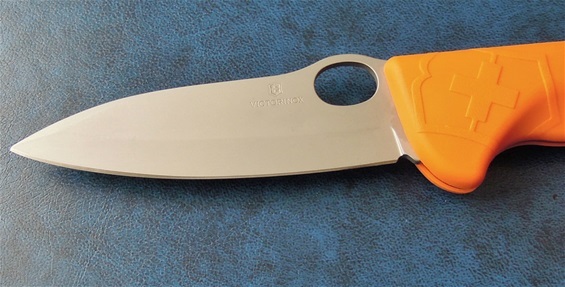 The Liner-lock used by other knife manufacturers is designed to be able to function after wear. 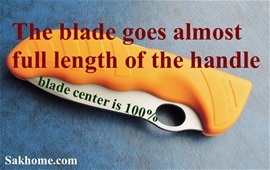 This means the liner will continue to have full contact with the tang on the blade because it got the angle correctly. The main liner-lock design is a full contact locking mechanism. The pressure against the edge is supported by a stop pin on the back of the handle design and construction. While the liner-lock holds the blade toward this for support. When you put pressure against the lock in other words the liner then it prevents the blade from folding. The precision, design and dimensions on this liner will determine the strength of it. Lock-back designs can also implement the contact parts abilities to continue to be safe and tight from wear. The mechanism itself is completely different from a liner-lock. I have explained that the Victorinox liner-lock is very different because it is a slip-joint mechanism with a liner-lock type designed against accidental closing. It is actually a very good design. "The length of the blade and weight influence the locking mechanism. One of the reasons for why larger blades need a locking mechanism is because of the safety. If you would use a slip-joint construction then this spring would have to be very strong. It depends on what use the knife is for. 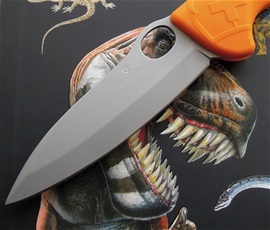 For professional Hunters then a locking mechanism must be on such a serious blade. I understand 100% why Victorinox decided to use a lock-back design on this knife"
The design on the Hunter Pro is very good and the blade is almost in full length of the handle which is good. The blade center is 100% on my knife and this is sometimes an indication on a precision made lock-back mechanism as well. There will probably be some variations on this. Correct riveting, design and blade center is a good sign. The Hunter Pro is 130mm and that gives a generous handle even for larger hands. It is a complete handle with traction all over the handle + there are parts for extra safety. It is a very comfortable handle. Locking mechanisms and the handle + the size of the blade is important. It is smart with lock-back knives to make sure there are no abrasive materials, particles or sand inside the mechanism. This at the cut section of the tang and spring. If you do some maintenance from time to time then it will be more durable and the functionality will be best at all times. It is also important that the blade can move freely. On this picture you can see the spring for the lock-back mechanism and the release for folding the blade into the handle. Make sure you press it down enough for the best folding of the blade so it does not cause unnecessary wear on the parts. Behind this spring and release you can see another part. On lock-backs there is another spring under and behind that hold the spring tension when the blade is engaged and closed. This you can feel when you press down the release for the lock. The durability on a lock-back depends on the precision, design, maintenance, use and construction. 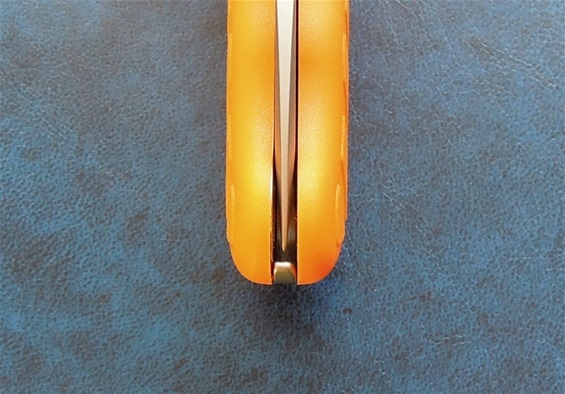 The Victorinox lock-back spring with counter parts and cut section in the tang got rounded edges to prevent abrasive and wear on the lock. There are angles for the contact parts and distribution of forces. Many times you can momentarily feel that the design is correct when you open the blade and the blade lock snaps in place. The terminology of the lock-back parts can be found on the internet. There are differences in what people call them. The visible top spring with the counter part for the cut section of the tang is called a lock lever and also rocker bar if I remember correct and the rivet that goes through this is a pivot point. This is important for the strength of a lock as well. The spring that causes the tension on the lever is on this knife in one piece with the spacer on the back. It is sometimes called a bar. In this case it is best to call it a spring. This spring is under the lever and cause pressure for to hold it in place. 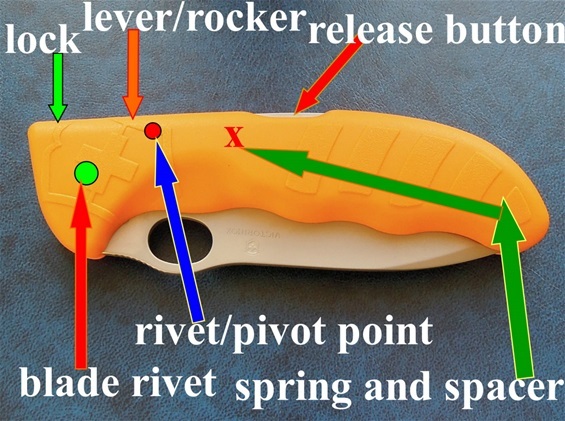 The pivot point and lock-back mechanism release “button” can be adjusted forwards or backwards and this cause some different mechanism philosophies. I will not go into this. What I can say is that this together with design can influence the stability and the amount of tension or spring pressure. Also in some mechanisms the pivot point and design can be made to have a lighter pressure than the tension from the spring. handle with care, it is sharp! Lock-back mechanism can have many designs and variations. 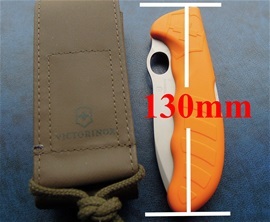 Victorinox use the back part that is a spacer, spring, continuation of the handle and for the attachment for the scales. The spacer and spring is in one piece and that is interesting. I have seen similar designs before on designs from Japan. Thank you for sharing valuable information everyone! 10:02 "PS i can add that the three rivets with busings are for sure also "peened" It is just that the bushings are for attachment of the scales as well"